If there’s one thing that we choose never to skimp on whether we’re at home or when travelling, it’s having a good cup of coffee. We wouldn’t consider ourselves full blown coffee snobs, but for the couple of cups we like to have each day, they’ve got to be good! Satisfying our coffee fix while travelling has been super easy with just come coffee beans, a grinder, a coffee press, and some mugs. That means it doesn’t matter where we are, because together they all fulfil our coffee desire at any time. 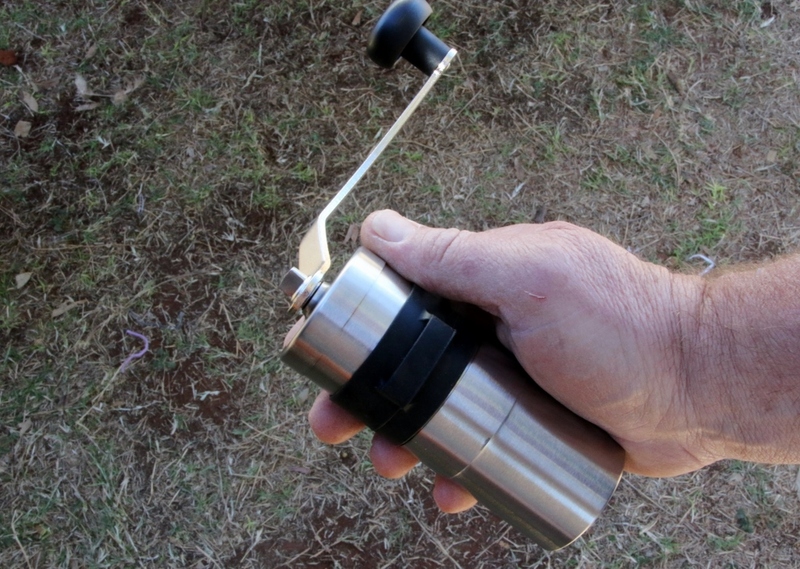 When we travel, we start by using the Japanese made hand grinder by Porlex that oozes quality. 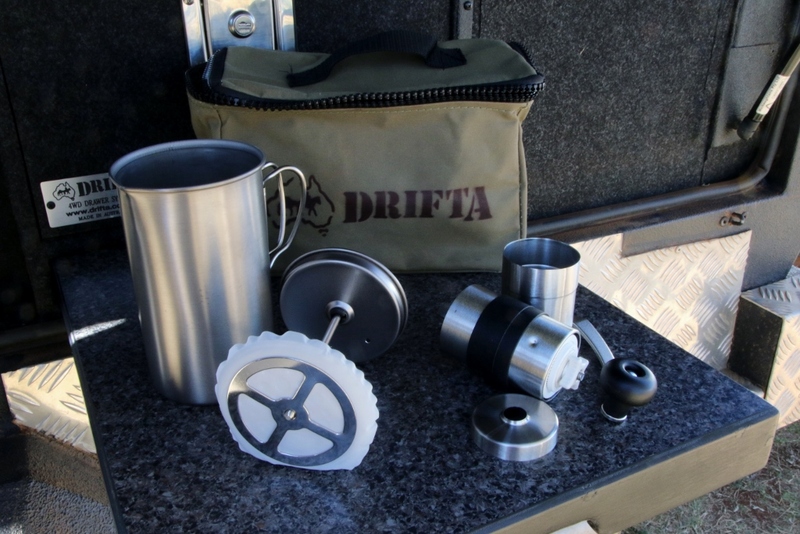 It’s lightweight and compact, and the design lends itself to appeal to a range of travellers who love freshly brewed coffee. The unit is made of high quality stainless steel and weighs approximately 250grams, and its winding handle tucks neatly into a rubber hand grip when not in use for easy storage. 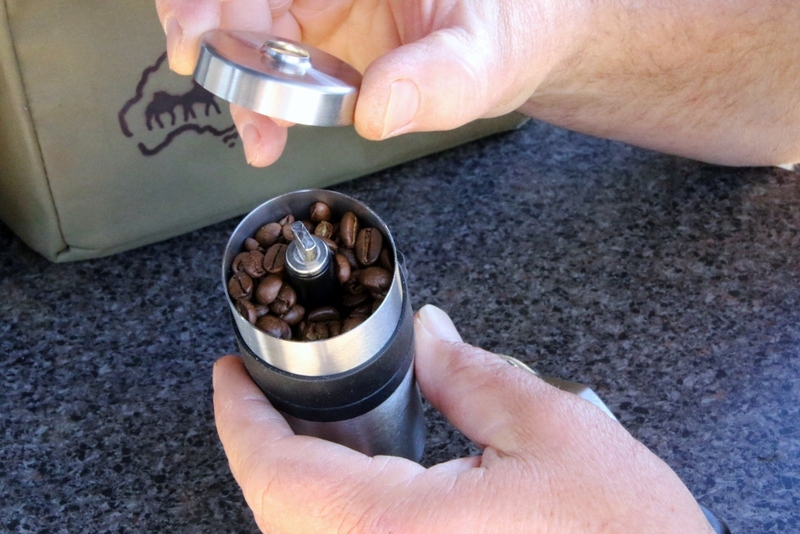 The grinder’s hopper holds 20 grams of beans which are ground by high quality ceramic burrs, and all the grinder’s components can be washed when the unit is pulled part. Grinding the coffee takes less than 3 minutes to grind a full hopper of beans (which is enough for the two of us to have a cup of coffee), and having the ability to adjust the grind to the way we like it is also a bonus with this unit. To keep with the lightweight theme, we use the Snow Peak Titanium Café Press to brew our coffee. It’s one of the lightest we’ve come across when it weighs in at only 200 grams. We previously used to travel with a glass press, so any breakage concerns are now long gone with the Snow Peak’s strong titanium construction. Storing the press is a breeze as it’s less than 150mm high, and it can be easy pulled apart for washing. Water measurements are available on the outside of the press, where you’ll also find a double handle which provided an extra level of safety when pouring. Water can be heated directly using the café press, although we choose to place near boiling water into the unit to brew the coffee (to avoid burning the beans). A small carry bag is also included. 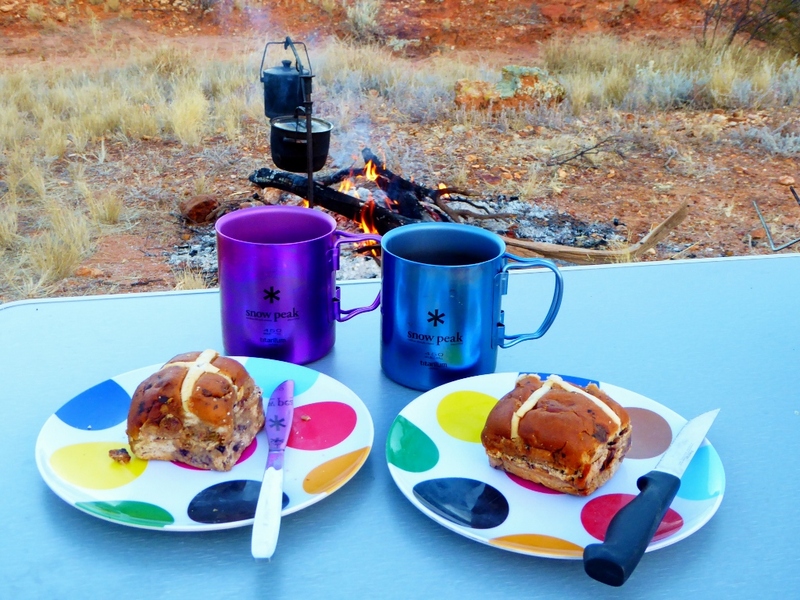 Continuing with the Snow Peak theme, we absolutely love our Titanium Double Skin mugs. Having previously used a range of mugs, we struggled to find something that would work for both of us. Plastic and melamine seemed to taint the coffee and the coffee would quickly go cold, or one of us would normally grizzle about the lip of enamel mugs as we found them difficult to drink from. So when we decided to eventually give the Snow Peak mugs a go, we wished we’d done it years earlier! 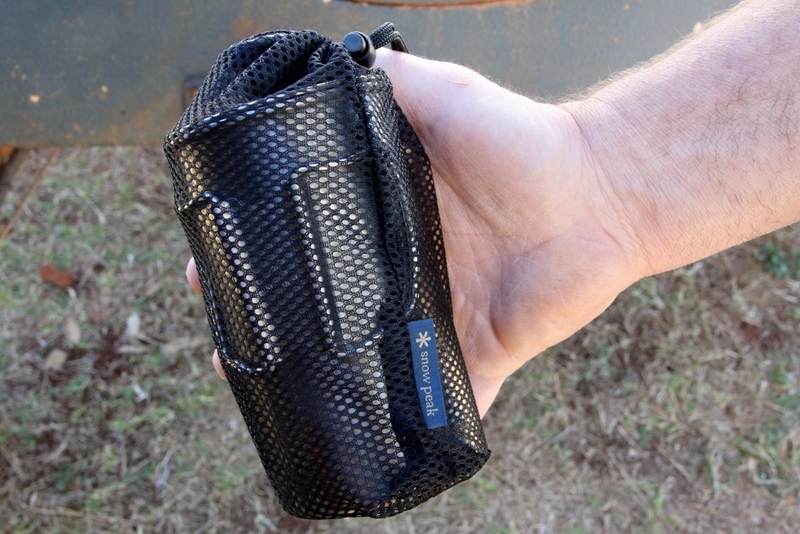 They’re so lightweight (less than 100 grams), they’re comfortable to hold with a double handle (that folds in for storage), and the contents stays nice and hot (but they’re cool to touch on the outside). And oh so comfortable to drink out of! We’ve got the 450ml mug size and bought the lids (optional extra) for the mugs to have coffee on the go. Other sizes are also available – 220ml, 300ml, and 600ml sizes. 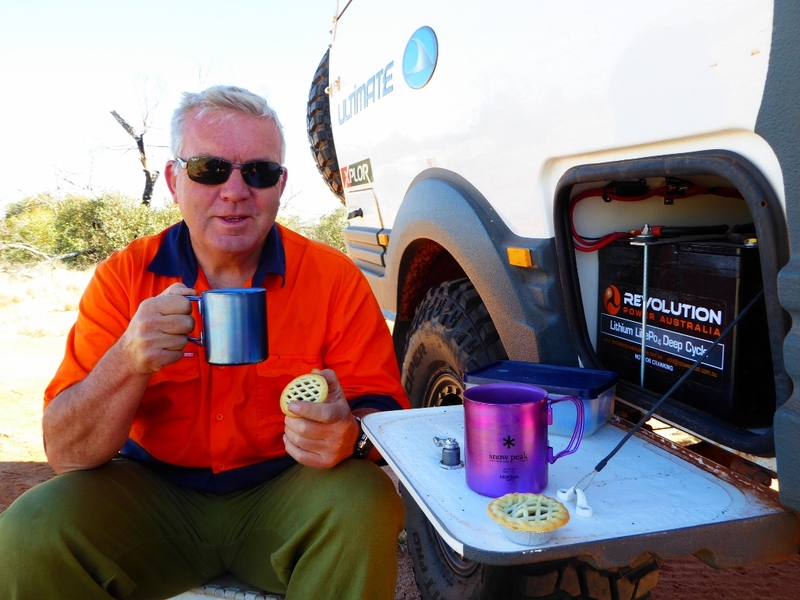 So between the Porlex Coffee Grinder, the Snow Peak Titanium Café Press and the Snow Peak Titanium Double Skin mugs, we’ve pretty well got our coffee recharging batteries covered and can easily get the daily kick start we need.